Collective action by the UN system is critical to reduce disaster risk, a fact underlined in the Sendai Framework and its linked post-2015 agreements, including the 2030 Agenda for Sustainable Development. The revised UN Plan of Action, approved in April 2016, is an opportunity for the UN to actively work as one towards meeting the Sustainable Development Goals. UNISDR is the focal point in the United Nations system for the coordination of disaster reduction and ensures synergy among the disaster reduction activities of the United Nations system and regional organizations (UN General Assembly resolution 56/195). UNISDR works with the wider UN system at headquarters and field levels. Through the commitments defined in the UN Plan of Action, 13 UN organizations, FAO, UNDP, UNEP, UNFPA, UNHABITAT, UNICEF, UNOPS, WFP, WMO, WHO, UNESCO, UNV and the World Bank have prioritized DRR within their 2014-2017 strategic work plans. The High Level Committee on Programmes/Senior Management Group (HLCP/SMG) is the mechanism through which the agencies deliberate and monitor the progress of the commitments anchored in the UN Plan of Action. The HLCP/SMG reports to the Chief Executives Board (CEB). At the working level, the agencies convened the Inter-agency Group which was involved in work streams backing the implementation the UN Plan of Action. 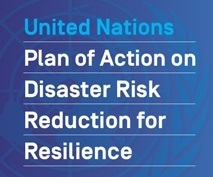 The UN Secretary-General committed to work on disaster risk reduction as part of his second mandate.The UN Plan of Action on Disaster Risk Reduction for Resilience offered a basis for the agencies to evaluate the integration of disaster risk reduction into their respective programmes and activities. It helped to position the work of the UN in the context of the remaining term of the 2005-2015 Hyogo Framework for Action, the development of what was to become the Sendai Framework for Disaster Risk Reduction 2015-2030, the overall post-2015 development agenda, and the UN Secretary-General's second mandate and Five-Year Action Agenda. The vast majority of disasters are linked to high-impact weather and hydrological events as well as climate extremes â including rapid-onset hazards such as tropical cyclones and slow-onset hazards such as droughts. Disaster risk reduction is, therefore, at the core of the mission of WMO and the National Meteorological and Hydrological Services (NMHSs) of its 191 Member States and Territories (on 1 January 2016). The Third UN World Conference on Disaster Risk Reduction was held from 14 to 18 March 2015 in Sendai City, Miyagi Prefecture, Japan. 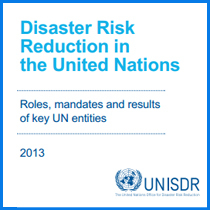 The outcome was the Sendai Framework for Disaster Risk Reduction 2015-2030. Before and during the World Conference, our UN partners engaged intensively with the process of preparations and negotiations that produced the Sendai Framework. The UN General Assembly endorsed the Hyogo Framework for Action (A/RES/60/195) and through subsequent resolutions reiterates the integration and mainstreaming of disaster risk reduction.